We the People want to strengthen our nation, as a beacon of equality, economic opportunity and freedom for all. We hold these rights to be essential to our vision of America and believe that the principles contained therein should guide our government, business leaders, organizations and individuals in our common goal of a just and fair society. 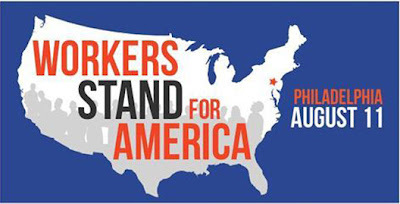 All Americans willing and able to work have the right to safe, gainful employment at a fair and livable wage. We call on the public and private sectors to invest in America’s infrastructure and promote industrial development, maintaining job creation as a top policy priority. Recent initiatives to disenfranchise citizens seek to reduce the rolls of eligible voters and empower money instead of people. We believe these actions constitute an assault on our nation’s democracy and history of heroic struggle against voting restrictions based upon property ownership, religion, race and gender and call for reinforcing our fundamental right to vote. All workers have the right of freedom of association in the workplace, including the right to collectively bargain with their employer to improve wages, benefits and working conditions. Education is a fundamental bedrock of our democracy, vital to America’s competitive position in the world and the principal means by which citizens empower themselves to participate in our nation's economic and political systems. Quality, affordable education should be universally available from pre-kindergarten to college level, including an expanded use of apprenticeships and specialty skills training to prepare Americans for the workplace. Americans have the right to a baseline level of health care, unemployment insurance and retirement security, all of which have been badly eroded by the disruption of the social compact that served the nation well for decades. We call on government and private industry together to confront the issues of declining access to health care especially for children, weakening of unemployment coverage, and inadequate pension plans that undermine the ability of working men and women to retire in dignity, even as Social Security and Medicare are under strain and threatened with cutbacks. National Organizations Endorse HR 4277!